Forget about Apple Pay and virtual wallets. Plastic credit cards are still being innovated and we’ve yet to really maximize their potential. That is…until now. A bank in the United Arab Emirates has just launched a credit card that emits an odor that is pleasing to women. 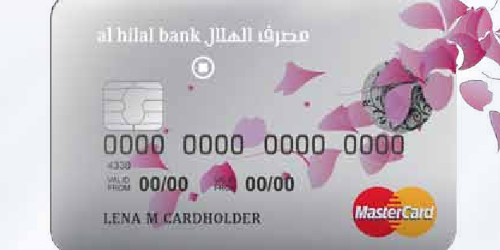 The aim of the new “LAHA Al Hilal” credit card released by Al Hilal Bank is to attract female customers who are “driven by ambition and determined to succeed,” per the product release. The LAHA credit card (LAHA is an Arabic word meaning “for her”) has a built-in applet that can absorb any scent of perfume that is put on its surface. By applet, I think they mean a little absorbent pad like a sponge in the top right corner of the card. The bank recommends that ladies only apply one or two drops of perfume on the card and then wipe off any excess liquid. Now why anyone would want/need their credit card to carry a scent is beyond me, especially when the cardholder probably already smells the same and simply touching the card or carrying it around should provide for plenty of absorption. Obviously it’s gimmicky, but it’s not just an odor-based credit card. It also comes with a variety of features that women may find pleasing. For one, cardholders get a free scented welcome gift from Hind Al Oud, a perfumer I’m assuming. Ladies also get a 10% discount at PerfumeSouq when they spend at least 1,000 in local currency. There are some other perfume-related discounts as well, along with free airport lounge access in the Middle East at a variety of airports and platinum dining offers afforded by the Platinum MasterCard. Finally, it comes with lots of other standard perks like various types of insurance and roadside assistance. While that all might sound good, the annual fee is around $270 in U.S. currency. So it’s by no means cheap. And if you don’t like perfume all that much, it’s probably not very useful. In summary, it comes as no surprise that this new credit card is from the UAE, where luxury and excess combine to push the limits on a seemingly endless basis. You can find all types of opulence in Dubai, from indoor skiing (in the desert mind you) to man-made islands and the world’s largest mall. Read more: Check out the most expensive U.S. credit cards.